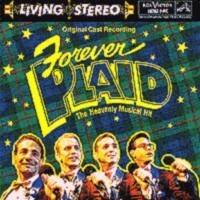 During the first summer of the Jive Kings ( then named Swing Kings ) I became "reputable" enough to be considered as a sub for the Mackenzie Theatre show that summer called Forever Plaid. Paul Camrass was cool enough to ask me to fill in for him for five weeks. In preparation I went to see the show and I was absolutely blown away by both the performers and the music. I was so incredibly excited to be a part of this. and not only was I going to be the bass player I was a "character" in the show. That summer I was 21 and I was playing the character "Uncle" Chester...and boy did I not look like an Uncle to the four guys in the show. So I tried to grow a beard...and man it was bad. Really bad. It was more like I had honey smeared on my face and I fell face first on a barber shop floor and picked up patches of hair here and there on my face. I took a lot of razzin for it too...but it was a good experience. I still can't really grow a beard so I'm used to getting razzed about it when I try. So this was my first "real" pro gig on a pro stage...and I dug every second of it. That summer I had also done dinner theatre...which is great..don't get me wrong...but on the 76th night of scraping the 8000th plate of half eaten chicken and baked potatoe mess into a garbage can and ineveitably getting it all over your costume which is dry cleaned ONCE A WEEK and THEN...getting to the Mackenzie Theatre and having someone tell you that your Shirt and Socks will be cleaned and pressed every night after the show and will be waiting for you in your dressing room every day before the show...well...all I said was "I don't have to bus plates??!?! @#$#ing A!" 1) That summer I bought a pickup for my upright for the Swing Kings...never having a lesson in Upright Jazz Bass, when I put the pickup on I naturally played my upright like an Electric Bass. When I tried to do Forever Plaid, Paul Camrass pointed that out to me ...he hit the nail on the head saying "You forgot how to make a sound on that bass man!....Dig in! Forget the pickup!" And it changed everything! 2) The bass I was using was a bass from UPEI's collection...it was a bass that the past Chair of the Music Dept., Alan Reesor, had in his office for a number of years. Compared to the bass I used before this thing it was beautiful...but the action was really bad and the body was near caved in making its "singability" almost null and void. But as it is my philosophy..playing the worse will always make you appreciate anything that's even a bit better. 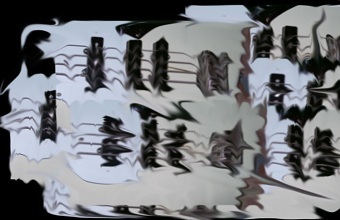 3) I was so used to playing in Concert Bands, Jazz Bands, String Orchestras that my "time" really wasn't ever tested enough...I never knew it but I was just really good at blending in with the surroundings and being part of the communal "time"....I was never really accountable for my own "time". Forever Plaid made that painfully aware to me and it was a neccesary step for me on the "road to recovery"...or well...."road to discovery" I should say...discovering "Time"! !